Whether you’re a band considering buying a sound system to travel with or an audio engineer trying to decide what system components to buy as part of your rig, it can be challenging. To make it even worse, usually you only have one shot to get it right because you are on a tight budget, which is usually you’re hard-earned money from playing out or your day job…or maybe both. It is critical that you get the best bang for your buck and who wouldn’t agree with that? Over the past few years, I have designed a few different systems with quite a few different components. Recently, I designed a temporary system for a site launch at National Community Church and needed to purchase a subwoofer that would pound a 300+ seat auditorium. We like to have a lot of clean low end in our mixes for our services but also, a gospel music driven church meets in our auditorium in the afternoon and I knew I would need a subwoofer that would be able to take a beating but do some pounding. After much consideration, I selected two JBL SRX728S and I could not be more pleased with my decision. This is a serious subwoofer with some rock solid low end. It features dual 18-inch woofers and a bass reflex design which pumps out frequencies from 27Hz to 220Hz. It is a passive subwoofer so it requires an amplifier to push it. The power rating is 1600 W/3200 W/6400 W. Let me break that down for you. JBL uses these numbers for most of their passive products. It can be slightly confusing but I’ll try to briefly explain so these specs are understandable. The first number represents the continuous power that the speaker can take. In other words, that number represents what the speaker can take all night long without freaking out. The last two numbers represent the program and peak wattage ratings. These numbers have been confusing to people for a long time. So, here are my super basic definitions of them. Program wattage is more of a musical crest that the speaker can take for a few seconds. Peak wattage is self-destruct. 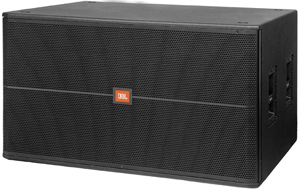 JBL suggests an amplifier that is about 3200 watts at 4 ohms. I chose to purchase an amplifier that was also in the Harmon (JBL’s parent company) family – a Crown XTi 4000. The XTi 4000 pumps out 3200 watts in bridge mono mode which is perfect for this subwoofer. When they arrived I wired them up and set my crossover points as instructed in the owner’s manual. Once I tuned my system, it was the moment of truth. Most audio engineers have two or three tracks they like to play through a system so that they have a reference point for determining the sound of a PA system. So, I pulled out my laptop and picked out a familiar song. The JBL SRX728S was able to accurately reproduce everything I threw at it. But even more important then tons of low end is definition and clarity. Some of that comes from your mains but if your sub is weak, you’ll never be able to make up for it. The warmth and fullness was exactly what I was looking for. It hit hard and was way more then enough for the room I was in. I could confidently take these subs into a room of 1000 people or so and rock the crowd. Whatever your music style, the JBL SRX728S subwoofer is a solid choice anyone looking to build their own rig or install in a venue. Jason Castellente has a Bachelors of Music from Valley Forge Christian College. He currently works at National Community Church in Washington, DC as the Production Coordinator, freelances as an audio engineer, and blogs regularly. Check out his website at www.jasoncastellente.com. Questions? Hit me up at Jason@musicgearreview.com.